What might come of Venezuela’s political crisis? 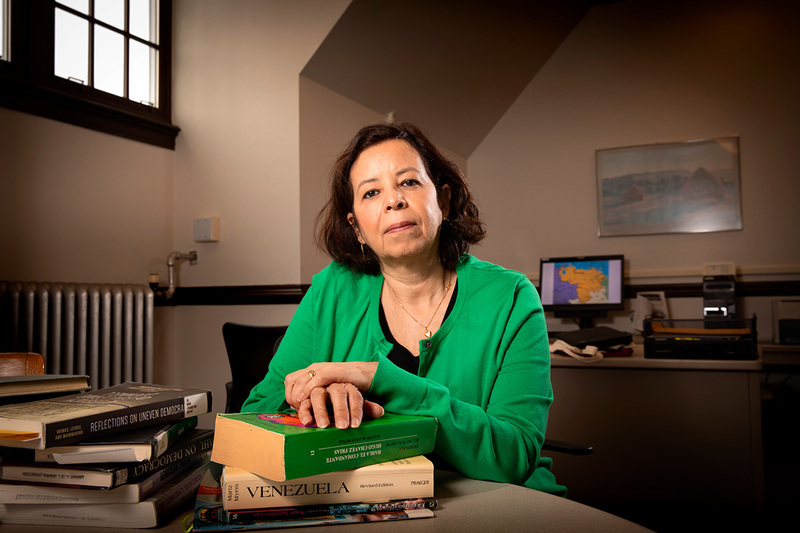 The move to take power from President Nicholas Maduro in Venezuela has united his opposition in a new way, but the country’s military will play a key role in any change, says U. of I. political science professor Damarys Canache. Venezuela already had a president, but on Jan. 23 it got a second one – at least someone claiming the title. The U.S. quickly moved to support him through sanctions and other actions, followed by other countries, including most of Latin America. 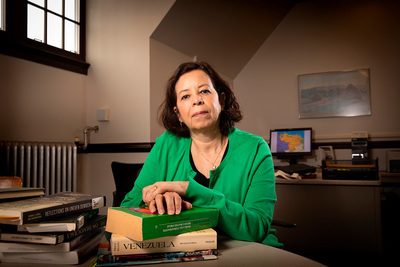 University of Illinois political science professor Damarys Canache is a native of the country and studies its politics. She spoke with News Bureau social sciences editor Craig Chamberlain about Venenzuela’s recent past and possible future. What’s the background to the current situation? For almost 20 years, Venezuela has been mired in significant political turmoil. Many Venezuelans have challenged the government – first of Hugo Chavez and now of Nicolas Maduro – through massive peaceful protests, riots, strikes and elections. All attempts at negotiation have failed. The crash of oil prices in 2014 left Maduro’s government unable to maintain a system of subsidies and price controls, but he has continued bad economic decisions that have brought the economy to its knees. Last year, economic growth dropped by 18 percent, hyperinflation hit 1 million percent, and a survey of living conditions found that 48 percent of households were poor. An estimated 2 to 3 million people – as much as 10 percent of the population – have left the country since 2014. This is one of the largest migratory movements in South America’s recent history. In 2014 and 2017, massive protests throughout Venezuela ended amid violence and repression by the government. In 2018, we did not see protests on the same scale, but a Venezuelan nongovernmental organization reported about 35 protests per day throughout the country. What led to the recent leadership crisis? This new cycle of protest mobilization was triggered by specific political events: electoral fraud in the May 2018 presidential election, international condemnation of that fraudulent election, and the opposition’s subsequent rejection of Maduro as a legitimate president, especially after he was sworn in for a second term Jan. 10. These events prompted the National Assembly, under the leadership of its president, Juan Guaido, to apply a constitutional clause that stipulates that when there is an absolute absence of a constitutional president, the president of the National Assembly should become the interim president until new elections are held. That led to Guaido being sworn in as interim president in the midst of a Jan. 23 massive demonstration. Guaido and his followers are calling for two things. First, they want a return to democracy, which in their view requires the exit of Maduro and his cronies from the government, the formation of a transition government, and the holding of free and fair elections. Second, they want humanitarian aid to attend to the urgent needs of the population. What are the factors working for and against a change in the government? Guaido’s decision to act as interim president, with the endorsement of the National Assembly and massive street support, brings new elements to the power struggle. First, the opposition is united and invigorated for the first time in a long while. Anti-Maduro and pro-democracy forces are coalescing around a new and young leader who is presenting an alternative to Maduro’s failed socialist policies. Second, and related to that, the political divide of the past seems to have dissipated under the brunt of social and economic grievances. The conflict is no longer along ideological or class lines. Third, Guaido’s leadership is offering a route to regime change. His pro-democracy forces have designed a strategy that could wield strong domestic and international pressures on Maduro’s regime. Fourth, Venezuela’s power struggle is now being debated on the broader geopolitical stage. On the one hand, numerous countries have recognized Guaido as interim president, while the European Union is calling for new elections in Venezuela. On the other hand, Maduro has the support of allies in the region – Cuba, Nicaragua, Bolivia – and from Russia, China, Iran and Turkey. Thus, the international community is now deeply engaged in seeking a solution to the Venezuelan crisis. Of course, a key factor for political change is the Venezuelan military. It has been a loyal supporter of the Chavista project, and at this juncture the high command of the armed forces has expressed its unrestricted support for Maduro. However, trouble is brewing inside the military. In 2018, several revolts were promptly repressed. According to journalistic accounts, more than 150 military officers have been arrested. And inside the institution there is a climate of continued surveillance over middle- and low-ranking officials. Guaido and pro-democratic forces have called for the military to withdraw its support for the Maduro regime and created incentives such as an amnesty law to encourage civilian and military personnel to collaborate with restoring democratic order. In addition, the international pressure created by economic and diplomatic sanctions could affect the power and privilege of high-ranking officials, and this could intensify internal strife. In short, there are incentives in place that can lead to splits within the military and ultimately alter the military’s decision to support Maduro. However, there are not yet clear signals of a major split. The U.S. has taken strong actions to support Guaido and push Maduro from power. How effective are these actions? And how are they viewed by Venezuelans? The United States recently imposed economic sanctions targeting the oil sector, which is responsible for 80 percent of the government’s revenues. It is unlikely, at least in the short term, that Maduro’s government can reduce the sanction’s negative impact, for example by redirecting its exports to other nations. The Trump administration has not ruled out, at least rhetorically, a military option in case Maduro refuses to resign. Latin Americans and many Venezuelans will oppose any American military involvement. Such a move will likely alienate some Latin American countries that are working in coordination with the United Stated for the re-establishment of democracy in Venezuela. In short, strong talk and strong economic action from the U.S. can be effective, but military action is unlikely to be well-received in Latin America as a whole. Editor’s note: To reach Damarys Canache, call 217-244-2500; email dcanache@illinois.edu.